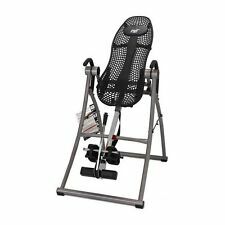 Spyder SL Hang Ups, USA, teeter Gravity Boots . Condition is Used. The best inversion boots you can get. Includes all the packaging and manuals. 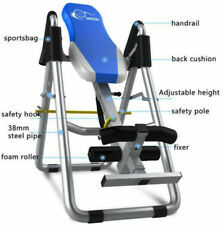 Check out my other items for loads more lifting gear including Powertec attachments and bench to expand your training. Can also be collected from East Ham London. Good luck bidding! 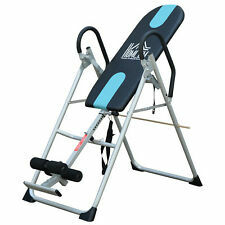 Inversion training can relieve back pain and tension. In addition, the inclination can be changed and adjusted safely and easily with the hand brake. Just make sure you only train when a head ache is not present. The table can also help with such areas as increasing body flexibility for improved athletic performance, reducing the effects of aging due to gravity, and relieving lower backaches due to sitting or standing. Inversion range of 180 Degrees. Foldable for easy storage. Reduces back pain. For your comfort the back support is made with padded foam, it has a PVC cover so can be easily wiped when required. Fast foot padded handles. Inversion range of 180 Degrees. Foldable for easy storage. Reduces back pain. Fast foot padded handles. Body height range: 147cm-198cm. Scratch resistant powder coating. 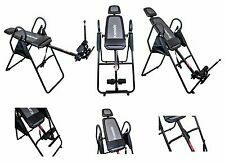 Introducing the ultimate inversion table by Senshi Japan. Allow Your Body To Distribute Blood Effectively: Inversion training allows your body to send blood efficiently around the body through the aid of gravity, this allows for multiple health benefits ranging from increased blood flow to even faster growing hair! Inversion range of 180 Degrees. 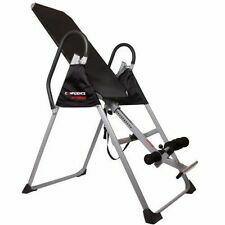 Inversion Table. Reduces back pain. Fast foot padded handles. Non slip rubber feet. Body height range: 147cm-198cm. For your comfort the back support is made with padded foam, it has a PVC cover so can be easily wiped when required. Inversion boots counteract the downward pull of gravity. Hanging in the inverted position brings instant relief to many forms of back pain and spasm associated with consistent downward gravitational pull on the spine, discs and muscles. Need help picking a model?. This design greatly reduces ankle discomfort to allow for a relaxing and secure user experience. An adjustable pillow included for comfort. Patented Pivot System Allows the bed to glide smoothly into and out of inversion without the rattles or weight-shifts that interfere with a relaxing inversion experience. Physio,Athletic, relief Back pain & Headaches. 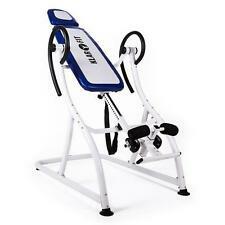 attach to virtually any chin-up bar. Allow Your Body To Distribute Blood Effectively: Inversion training allows your body to send blood efficiently around the body through the aid of gravity, this allows for multiple health benefits ranging from increased blood flow to even faster growing hair! New Round Hanging Wall Vase Planter for Succulents Herbs Wall Decor 1PCS. Bearing weight: 300kg. Artificial Fake Danish Cookies Chocolate Cream Sandwich Cookie Kichen Decor. Hang Up Side Down,SPIDER Gravity Boots Flexible Boots allows for comfortable fit and minimizes any pressure points. Deluxe Gravity Boots Extra Long for more Ankle Comfort. GRAVITY BOOTS. Foam outers and super soft foam liners for comfort. Gravity Boots Pair of inversion boots for reducing back pain, spasms, and muscle fatigue Fights compression. Shihan Power Sports Anti Gravity Boots. Good to stretch your spine and for abdominal exercises. Inversion range of 180 Degrees. 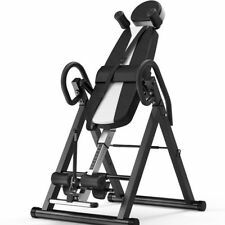 Inversion Table. Materials: Steel, PVC. Adjustable height. Reduces back pain. Foldable for easy storage. Durable PVC mat. Made to eliminate any discomforts other gravity inversion boots. United Kingdom. 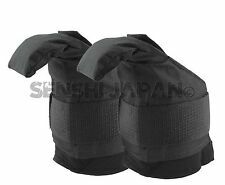 Senshi-Japan LTD. • Can fight compression fatigue caused by high impact exercises. About Evinco. One size fits all. 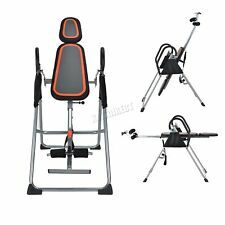 Gravitational Inversion Table. 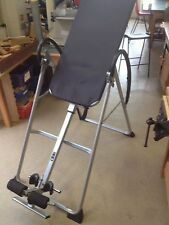 1X Inversion Table. Buying the available sales conditions are acceptedhere. RIGHT OF RENUNCIATION. TECHNICAL DATA. Orthopedic back stretcher is shaped like the spine’s natural curve to support muscles and help relieve tension and fatigue. Aims to ease fatigue and aches. Back-stretching aid. Available colours: green, black, red or blue. Magnetic Mat Small to walk. MAGNETIC WALKING TAPE FOLDING SMALL MAT 78 X 38 CM. 1X Folding Magnetic Walking Tape Small Carpet 78 x 38 cm. It is foldable, closed occupies little space. Anti-slip mat -, 38 x 78 cm.